Due to project commitments I’ve been extremely busy the past couple of weeks so I neglected to post information concerning my appearance at a video game industry gathering this coming weekend, Saturday the 28th of February at the Diamond Club, Angel Stadium in Anaheim, CA. Westwood College is sponsoring an event where video game developers will be getting together to talk about and discuss our industry. 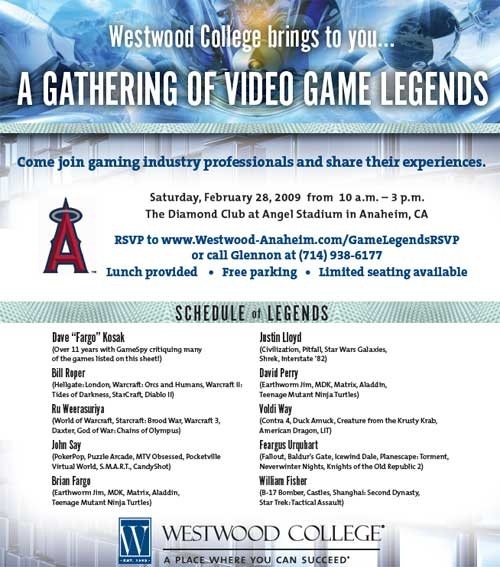 I’m one of the featured “legends” that will be there along with many other veterans such as Brian Fargo, David Perry, Voldi Way, John Say, Feargus Urquhart, William Fisher, Ru Weerasuriya, Bill Roper, Dave Kosak and many, many more illustrious industry luminaries talking about our experiences working on video games. If you’re interested in attending be sure to RSVP soon as space is quickly filling up.